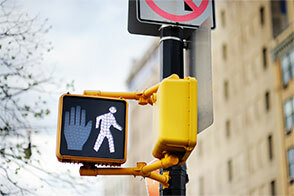 Pedestrian accidents are a continuous problem in New York City and Long Island. Though New York City pedestrian accidents have fallen in recent years due to new traffic laws and a lowered speed limit, people are still being struck by vehicles and sustaining major injuries. Pedestrian accidents are very dangerous, often deadly. When one walks on the streets of Long Island or New York, they have little to no protection if hit by a car. This means a higher risk of serious injury or death. Motor vehicles are usually the culprit in negligence-related pedestrian accidents, though a pedestrian can suffer injuries in a variety of situations. The Noll Law Firm, P.C. is committed to protecting the rights of victims of pedestrian accidents and help them recover the damages they deserve. The negligence of a motor vehicle operator often accounts for pedestrian accidents. Some of the time, distracting driving plays a large part in the accident. Though electronic device laws are in place to protect everyone, some people continue to violate the law and use cell phones to make calls, send emails, and search the web while operating a motor vehicle. Distracted driving continues to be a major cause of auto accidents. Speeding, driving while impaired, and reckless driving can be a factor as well. Motor vehicle operators who rush through intersections, maneuver a car irresponsibly, or drive under the influence can put everyone on the road at risk, especially pedestrians. Sometimes, the condition of the roadways and walkways plays a large part in a pedestrian accident. The maintenance of New York and Long Island roadways and walkways can cause a pedestrian accident. Uneven roadways, potholes, and closed sidewalks are just a few of the obstacles that lead to pedestrian accidents. Other times, weather can play a large part in a pedestrian accident. Icy conditions, snowfall, and rainfall can be the root of the problem. Other times, objects can reduce the visibility of cars and pedestrians. Items placed at curbs, like sidewalk or construction signs, a parked truck or bus, and even foliage can make it difficult to see pedestrians and for pedestrians to see motor vehicles. Pedestrian accidents can occur when visibility is reduced and objects block the line of site for pedestrians and drivers. In those cases, one might be able to recover damages from more than just the driver and an experienced pedestrian accident attorney at The Noll Law Firm, P.C. will be able to guide you through the law and see if you have a valid case.